Agnes is the cutest girl put on screen in recent years. Even more amazingly, the whole bunch of the three kids is not annoying and this, my fellow readers, is a feat not seen very often. Is there anything else you should know or that’s important? With the exception of one another thing, the answer is mostly ‘no’. Despicable Me is you standard, run-of-the-mill 3D animated popcorn family movie that is so predictable I cannot even make fun of it. The writer s completely relied on the standard story template where you only have to fill in some jokes, funny sidekicks and the character’s names. The rest of the script’s already finished with the usual structuring and an ending promoting the usual family oriented values of friendship/trust or something similarly shallow I’m sick of as of late. As with all the other 3D animated flicks everything that happens on screen is harmless, even friendly at times. 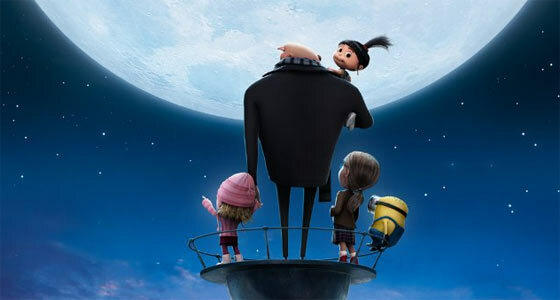 So the plot lacks any depth or true character growth because Gru is not evil to being with. The closest thing I can come up with to describe him is “grumpy” and therefore his change to the better is not convincing because there’s no real change at all. Just compare Gru to Syndrome from The Incredibles and you can see the vast differences immediately. Strangely enough the lack of depth doesn’t really hurt Despicable Me because the creators wisely decided to make the other characters the heart of the movie and Gru the dude who connects everything. Besides the girls, which are almost Japanese anime levels of cute, there’s of course the Minions which are the big other exception I’ve mentioned above. The Minions are the not so hidden stars of Despicable Me and rightfully so. Seeing those cuddly little guys in action with their quirks and childish behavior was a blast to watch and I just couldn’t get enough of them. The producers knew very well that they were sitting on a gold mine so they’ve added the Minions in every scene possible. It was the best decision they could make and because of this I assume that the producers were well aware of the fact that the plot is one big stereotype without substance. It’s the three cute girls and the Minions that completely save Despicable Me from being a disaster. Surprisingly, the two elements make this movie a far better watch than its true plot quality could ever achieve. I was also quite thankful to see that there are also not that many pop culture referenced jokes in Despicable Me – or I simply didn’t notice them because they were too subtle. One of the best pop culture jokes in recent years is the Bank of Evil which – as the sign says – is a subsidiary of Lehman Brothers. If for nothing else, everybody else in Hollywood should use this joke as a perfect pop culture referenced joke. It’s funny but it’s subtle and when you’re not fast enough you’ll miss it. Compare that to some of the other 3D animated movies which often seem to be solely written for the purpose to connect some unfunny pop culture references. That alone is a reason to give Despicable Me a big hug. Predictable plot married to Agnes and the Minions. A win nonetheless.